As you take shelter from yet another downpour and check in on the interwebs, have you seen that thing Pope Francis said about humanity ruining the planet? Or Jeb Bush’s command for him to shut his pointy-hat wearing trap? Or the latest on California drying up like a raisin? 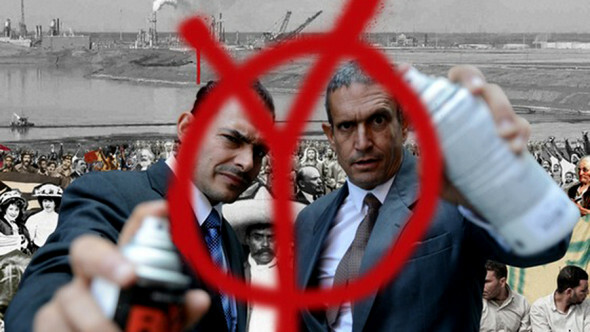 Well, there’s a documentary out on that theme, The Yes Men Are Revolting. The Yes Men, activists Andy Bichlbaum and Mike Bonanno (not their real names) have been together since the 90s egging each other on to ever escalating heights of ridiculousness in an attempt to prank corporations and climate change deniers. Often, the stunts get picked up as legitimate stories by mainstream media, before the folks they’ve been impersonating scramble to set the record straight and do damage control. This, the Yes Men’s third film, covers their attempts to draw the public’s attention to climate change while simultaneously dealing with transformation in the duo’s own lives. They’ve been doing this gig for a while. Now, Bonanno’s married with two kids and one on the way. Bichlbaum finally finds a man he wants to settle down with. Both men have other jobs that put demands on them. They’re asking questions: How much time can they devote to their stunts and each other anymore? Is activism even worth it? What difference are they actually making? Isn’t the world in worse shape now than when they started? Despite these questions and the gloom generated by any discussion of climate change, The Yes Men Are Revolting will not result in you wanting to slit your wrists. Bichlbaum and Bonanno’s enjoyment of each other and their vocation, the silliness of their fake names and awful disguises, the quality of the ideas at the heart of their pranks, and a final act that involves getting defense contractors to awkwardly dance, make this film fun and even potentially inspirational.